I have some work in A Shot to the Arse, an exhibition coming August 14th at Michaelis Galleries, Cape Town. Many thanks to Belinda Blignaut! Watch this space for more information on the accompanying Zine ‘BISM‘. Presented by Michaelis Galleries, A Shot to the Arse explores the interrelationship between art and change; how artists process, comment on, react to or transform upheaval, violence, destruction and everyday experience. Curated by Belinda Blignaut, it seeks to be a document of the spirit of our time, taking into account universal cycles of history repeating itself, and examining what counter culture is to us in 2012 – our emotional responses and cultural equivalents of political opposition running counter to a social mainstream. In keeping with this subversive motivation, explorations of the theme will see a number of manifestations, through installation, sculpture, collage, drawings, gif-art, sound-works and performance. The main part of the exhibition will primarily be housed in the traditional gallery space – itself a site of contention – in which a unique provocative experience will be created exploring restriction, decay, growth and adaptation; from the human to the organic to the machine. However, in an effort to engage their art in an active conversation with society and the street, artists such as Steven Cohen will also facilitate a number of city interventions. The exhibition extends further through the production of BISM, a D.I.Y special limited edition book on sale during the exhibition that contains original signed artwork by various artists. Copies of some of the pages, or visual slogans, will be displayed around the city to move the impact of A Shot to the Arse beyond the gallery. An ongoing document, Dirty Boots forms an organic on-line archive, allowing the project to grow should it want to do so. 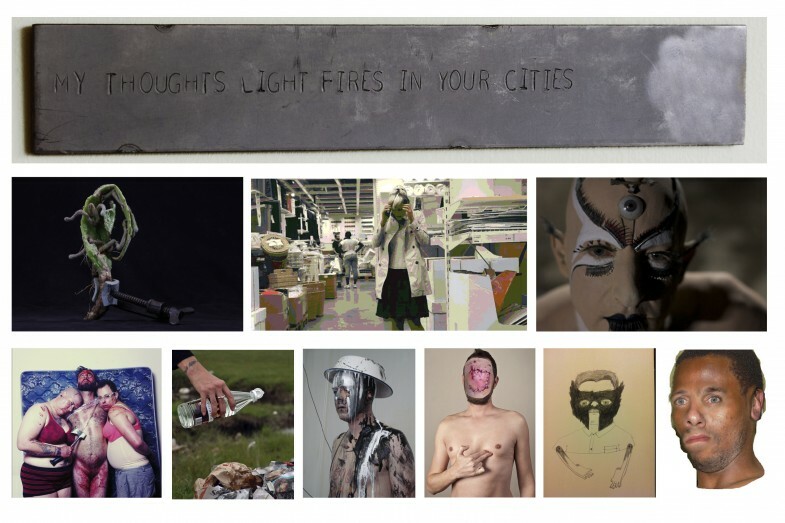 Participating artists are Stuart Bird, Belinda Blignaut, Jan-Henri Booyens, Breinskade, Kris Canavan, Steven Cohen, Jesse Darling, Simmi Dullay, Ediblspaceships, Kendell Geers, Gabrielle Goliath, Nadine Hutton, Jimmy Kipple Sound, Christian Nerf, Panga Management, Daniel Rourke, Athi-Patra Ruga, Wilhelm Saayman, Richardt Strydom, Linda Stupart, David Tallis, James Webb, Vanskrum, Konrad Welz, and Roger Young, with the exhibition and book introduction by Marlene Bramley. A Shot to the Arse opens at 18:00 on 14 August, and will run until 4 September 2012. Opening hours are Tues – Fri 11.00 to 16.00, Sat 10.00 to 13.00 or by appointment. The exhibition is made possible through a grant in aid from the Gordon Institute for Performing and Creative Arts (GIPCA) to Michaelis Galleries. For further information, please contact Cara van der Westhuizen, Tel: 021 480 7170 and cara.vanderwesthuizen@uct.ac.za. The Noise of Being: available at sonicacts.com!